Improv Sewing by Nicole Blum and Debra Immergut is a collection of projects and patterns that you can make on the fly and sew using a standard sewing machine. It's my favorite kind of sewing book. It doesn't depend on couture techniques or fussy cut detailed patterns. The patterns are made of simple lines and easy to create in the size you need. They leave some things unhemmed because knits don't come unraveled. Lots of embellishment techniques to create a look for yourself, your child or your home that's unique and artistic. It starts with an introduction to fabric types and tips for sewing using a sewing machine with those fabrics, how to clip seams , use foldover elastic and ideas for thrift store shopping. The instructions are very complete. If you're a novice sewer, you'll want to read through the chapters in order to understand how to put together the basic patterns before you get into the embellishments. The clothes I wear the most are comfortable jersey knit skirts and dresses, and I like things that are easy to make and can be made with thrifted finds. Chapter 2 is Finding Your Fit- starting with how to take measurements, then using a well-fitting teeshirt your willing to cut up to use to make basic patterns. You will learn how to make a pattern for an a-line skirt that will fit perfectly with an elasticized waistband and how to make dress patterns with different necklines using the teeshirt pieces. The patterns use jersey knits for easy sewing. Chapter 3 is Five Basic Designs. While there are several projects for children in this book, these patterns are for adults. They explain different sleeve types, and the patterns are easy wear casual pieces with lots of style. Tunics that can be dresses and skirts that could easily become wardrobe staples. Two of the skirts use woven fabrics. My favorite is the three panel wrap skirt. In Chapter 4, Ruffles, Pleats and Trims, you'll use your basic pattern pieces with techniques like ruffles, ruching, shirring, binding and pleats to make dresses and shirts. My favorite project in this chapter is a toss up between the very feminine ruffled dressy dress and the ruffled wrap. Chapter 5, Lines, uses lines of thread machine sewn for embellishing. This chapter has some clothing, but it also has a bunch of great home accessories that also make good gifts. My favorite projects are the nesting boxes made of canvas with great contrasting thread details and the meandering cardigan made from an old long sleeve teeshirt. Chapter 6, Doodling, Sketching and Writing, doodle stitching with your sewing machine. Creating images and designs, this chapter has an introduction which explains the basic method. There are great home decor projects in this chapter, as well as a tubular constructed sun dress with a nice detail of leaf embroidery. My favorite projects are the fiddlehead dress with it's delicately spiraled fiddlehead fern shapes, and the potluck dish cover. Chapter 7, Applique, has both regular applique and reverse applique projects. The scarf from the cover is in this chapter. My favorite projects are the colorful All-Weather Applique Mobile, and the easy to sew Hoodie Scarf which also makes a wonderful gift. Chapter 8 , Stenciling, one of my favorite techniques, these are freezer paper stencils for nice sharp lines. A monogrammed shaving pouch that makes a nice gift for men and a soft knit wrap skirt stenciled with an umbrella are my favorites from this chapter. Chapter 9 , Beyond Fabric, is non-fabrics. Sewn paper, plastic, cork, Tyvek and vinyl. I love the pencil pouch that could be made using a favorite sketch and the wind spinner made from card stock. Chapter 10 is Upcyling! One of my favorite things in the world. Felted sweaters make long mitts, cotton fabric from old shirts and dresses to make very pretty potholders and other wonderful projects. My favorite is the wrap skirt made from 3 men's dress shirts. 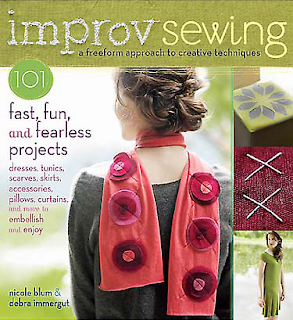 Chapter 11 is Instant Gifts, Instant Gratification, super quick to sew items that make great gifts for friends on short notice. These use techniques from the previous chapters to make small, fun gifts. The loose leaf paper machine stitched to look like notebook paper can be hand embroidered with your personal note. I like the idea of stitching that with something like "Michael + Shala= True Love 4-ever" for a newly married couple. The jersey shawl is really easy to make and customize and that's my other favorite project from this chapter. It finishes nicely with the templates for the decorations, a resources list and a complete index.